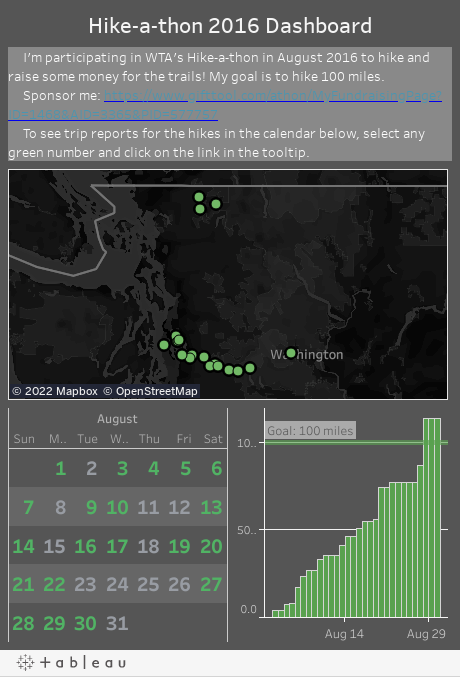 This August, for my second Hike-a-thon, I decided to set an ambitious goal for myself – to hike 100 miles. It required me to use all of my weekend days for hiking as well as quite a few weekdays, including trail runs, workday park walks, and backpacking trips. Unsurprisingly, many of the hikes were closer to home, since that’s what made the most sense on weekdays. Highway 2, Mountain Loop, and Rainier were noticeably missing from the hiking map, but I’d done hikes in all of those areas in July. My love for nature’s beauty is a trait that is shared by my other family members, and most of our family trips now tend to revolve around hiking. My dad was in Washington for a few weeks in August, and we decided to take a weekend trip up to Mt. Baker, where we rented a co-worker’s condo and did some hikes in the area. I haven’t had as much time to do group hikes with my friends this year because of Mountaineers requirements and other commitments, but Hike-a-thon pushed me to do more of this. I finally walked through the Snoqualmie Tunnel (aka “Creepy Tunnel”) with a group of friends. I also did a nice weekday evening hike to Talapus Lake with some friends, where we were rewarded by a close up sighting of a barred owl right after sunset. I do plenty of hiking trips where I’ll drive 3 hours each way to the trailhead, but I tend to neglect things closer to home. Exploring local parks was a highlight of Hike-a-thon 2014 for me. This year, I didn’t aim to hike new local parks, but I spent a lot of time in familiar parks closer to home. I went through all of the main trails in Bridle Trails, what I consider my “home park,” and I finally made it through the Coyote trail without getting lost! Trying to make use of all available time, I pulled some co-workers out during the workday for short hikes in parks close to work. We got to see some beautiful scenery, and it was a really nice break from sitting in front of a computer screen. I had one more scramble to do to complete my graduation requirements for the Alpine Scrambling course I’ve been taking, and I did it during Hike-a-thon on a brutally hot but lovely summer day. We scrambled up a lesser travel part of North Bend and had nice view with lots of wildflowers. I did two backpacking trips during Hike-a-thon. The second one was at the end of the month, a somewhat last minute solo trip to the Enchantments using Snow Lakes permits that someone else had canceled. This is one of the most beautiful areas I’ve ever hiked in, and it was perfect that I crossed the 100 mile mark for the month in the Core Enchantments, on my way up to Enchantment Peak. Thanks to everyone who hiked with me and/or sponsored my Hike-a-thon! As I’ve gotten more and more into hiking, I’ve wanted to contribute back to the efforts that make it possible for me to do what I love. I’ve donated money and participated in WTA’s Hike-a-thon (and am participating again this year), but I also wanted to do volunteer trail maintenance. I got as far as buying work gloves last year, but I never signed up for a shift, since it’s so hard to prioritize that on prime hiking days. This year, I knew I would get my trail maintenance day in because it is one of the graduation requirements for my Mountaineers course. I’m fortunate enough enough to work for a company that gives all employees one paid day off to do volunteer work, which was a perfect way to do this without struggling with giving up hiking days. Other people in our Hikers Hipchat room had a similar idea, so one member decided to contact the right people to get our own company trail maintenance day set up with WTA. Our project site was Denny Creek, most of us on trail before the waterslide. Even though it was a weekday, there was a lot of traffic going up. My group was working on a segment of trail where water running over the trail was starting to wash away parts of the trail, leaving exposed roots as trip hazards. We cut dead roots, dug proper drainage to direct the water away from the trail, put rocks and mineral soil down around the remaining roots to create a smooth trail, and replanted some ferns to discourage people from walking in the drainage. It was a hot day and the work involved a good amount of physical effort, but we had time to take some breaks, and it was a fun experience. In addition to making a positive difference on the trail, the experience was an educational one as well. Before, I figured I understood the impact of trail maintenance after hiking trails with lots of blowdowns. I’ve certainly done my share of complaining when a trail is muddy or rooty, and I’ve hiked with a lot of people who have done the same. However, after experiencing how much work has to be done to make trails look like beautiful, shining examples, I have far more appreciation for the them. I’ll certainly continue to put in my trail maintenance hours in the future, and if more people do the same, then maybe we can have less mud and more lovely trail! Over the years, I’ve gotten more and more into hiking and backpacking, and I’ve also found that I enjoy both as solo pursuits. I take reasonable safety precautions when going out alone, but I also knew that I was sorely lacking in knowledge in areas like navigation (obvious to anyone who reads my trip reports), which was becoming more of a blocker as more and more off-trail travel ideas found their way onto my list. A number of my friends have taken alpine climbing classes and recommended them, but I haven’t (yet) had the desire to do anything technical. But when I saw that the Mountaineers also offered an alpine scrambling course, I started seriously considering it. After waffling over the commitment for awhile, I finally signed up for alpine scrambling through the Everett branch, which was slightly further than the Seattle branch but was recommended because of its smaller group size and closer community. As a bonus, the field trip dates all lined up so none of them fell during SIFF. The course seemed like a small commitment – just 5 classes and 3 field trips – but the extra requirements made it a bigger thing. I also needed to complete basic navigation, wilderness first aid, a stewardship day, and three additional scrambles (one rock, one snow, and a third of my choice) to graduate. At this point, I’ve done everything except stewardship (which I have scheduled for later this month with a group at work) and two of the additional scrambles. This was the first out-of-the-classroom thing I did, and I felt like I learned a lot. We first had a few hours of lecture, where we went over things that I’d already read in Freedom of the Hills, with a few paper exercises. My math brain took to all of it really well. The remainder of the class was practicing in the woods with map and compass, and it felt like an accomplishment to reach our planned destinations. I still think I lack some general intuition/common sense when it comes to where I’m going, but after this class, I feel a lot more confident in my ability to get there. This was a tough one. Two full weekend days in a classroom, then an evening of scenarios practice. Good information, though, and I feel like I know some things that might be useful in an emergency situation. The tough part will be remembering everything over time, and I plan to return as a volunteer patient for future scenarios sessions to get a refresher. We had three field trips, a rock field trip near Leavenworth, a weekend snow field trip at Mt. Baker, and an experience field trip at Alpental. All of them were fun, but the snow field trip was by far the best experience for me, both in terms of interacting with the group and gaining knowledge. I’ve always been really tentative on snow, going out of my way to active avoid running into it. After learning snow travel techniques and ice axe arrest, I feel more confident now, and I even did a few early season hiking trips where I traveled through significant amounts of snow. I really did not want to throw myself down a snow slope head first for ice axe arrest practice, though! We had sunny, gorgeous days so the views were magnificent, and staying at the Mountaineers Lodge was nice and cozy. After that trip, we felt more closer as a group, and I hope I’ll have the chance to hike or scramble with other people from the class again. My first priority after SIFF ended was to try to get my snow scramble out of the way before too much snow melted. I joined a scramble to Buell and Barrier Peaks (near Mount Rainier) with a leader from the Tacoma branch. It was great to meet some new people and successfully summit two peaks in one trip! I’m looking forward to a summer and fall full of more hiking adventures. Stay tuned for August Hike-a-thon, when I’ll be hiking like crazy and trying to raise some money for the trails!